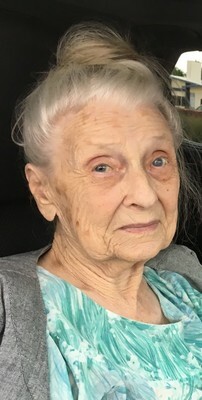 Maxine Purinton age 97, formerly of Cambridge passed away at the Mike Conley Hospice House in Clermont, FL on October 9, 2018. She was born on October 7, 1921 to Joseph and Eunice (Johnson) Brandt in Frontier County near Cambridge, NE. Maxine attended and graduated from Cambridge High School in 1938. Maxine taught in Country School for 3 years after graduation. On October 22, 1941 she was united in marriage to Edward Thomas Purinton, Jr. Ed preceded her in death on February 28, 2015. She was a member of the B-Square Club. Maxine enjoyed cooking and sewing. Maxine and Ed enjoyed traveling and spending the winters in Florida after they retired from farming. They moved to the Heritage Plaza in 2009 and Maxine moved to Florida in 2015 to be close to her daughter, Denise. She was preceded in death by her parents: Joe and Eunice; husband: Ed; sister: Mildred Kinney. Maxine is survived by her daughter: Denise O. Purinton of Clermont, FL; son: Steven C. wife Judy Purinton of Fayetteville, TN; 3 grandchildren: Jennifer and husband Jeff Day; Meredith and husband Tim Robinson; Robert and wife Elizabeth Purinton. 5 great grandchildren: Madeline and Lauren Robinson, Josilin Day, and Alexander and Ava Purinton. Graveside services will be held on Saturday, October 20, 2018 at the Fairview Cemetery in Cambridge with Bill Weaver officiating. Memorials may be left in Maxine’s name at Lockenour-Jones Mortuary. Friends may leave on-line condolences at lockenour.com. Lockenour-Jones Mortuary entrust with arrangements.